Dawn of War and Space Marine developer Relic Entertainment will continue to invest in PC game development despite the recent spate of high-profile video game leaks. But the Canadian studio has admitted PC piracy "is always a concern". "It's always a concern as a company, but it's not one which is driving the decision to make PC," Relic marketing manager James McDermott told Eurogamer. "For us, the drive to make PC is, really big, established, DOW community, they're PC gamers, there's probably going to be crossover to Space Marine. It felt like it made sense to make a Space Marine game for PC." Square Enix is currently in the process of suing a group of Italians it believes were responsible for the leak of upcoming sci-fi action role-playing game Deus Ex: Human Revolution. The Japanese company reckons the game was obtained through a Steam press account normally reserved for game journalists. It was the latest in a string of leaks this year that have caused some to question the viability of creating PC versions of multi-platform games. Relic is right now discussing how to handle the process of allowing game journalists early access to Space Marine. "One of the things that's come up is the concern about the PC and the protection for it, because it doesn't have any major protection," McDermott continued. "It's obviously going to have the keys and stuff for when it launches, but the actual code base, you could rip out the executable and stuff like that. "It's just ensuring everyone is trusted partners. The conversation's just started on that. On PC, with that, there's always going to be that challenge." 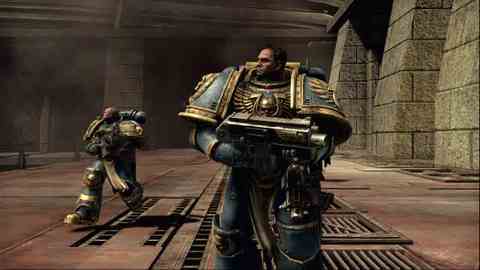 If Space Marine was leaked, "It would definitely be soul destroying," McDermott said. Relic has seen impressive results on PC, and expects its success on the platform to continue with the multi-platform Space Marine. "THQ has quite good traction with PC sales," McDermott revealed. "Steam numbers continue to be really good for us. "Relic have been into PC games for a long time. We're still seeing a lot of good numbers can come from that market. We still think it's viable. "We've already seen pre-orders are pretty high for PC on Steam. McDermott said Relic remains unconcerned by the apparent doom and gloom around PC gaming, calling the PC a "great platform". "Some people just think it would be easier if PC went away. I just get that sense sometimes. It's because PC is such a tailored market in terms of the kind of platform you have to have. The barrier to entry is a lot higher than just, go and buy a console. "It just seems like there's more complexity to it, which is probably somewhat true. But it is a great platform. For first-person shooters, that's still where I want to play." More ultra-brutal RTS mayhem? Cool.